Make your vacation or special occasions more fun and memorable when you spend it here at VES Food Resort and Villas. Along Mc- Arthur Highway near Caltext Gasoline Station and Mcdonalds. Accessible via private and public transport route. Take NAIA Rd and Roxas Blvd/R-1 to A. Bonifacio Ave/R-8 in La Loma, Quezon City. Slight right onto Imelda Ave/Ninoy Aquino Ave. Turn left onto NAIA Rd. Continue onto Seaside Dr. Turn left onto Diosdado Macapagal Blvd. Make a U-turn at Pacific Ave. Destination will be on the right. "Satisfied Customer due to Great Service and Great Amenities"
The stay at the hotel is quite satisfactory. All our needs were served. The booking price is quite higher than the walk-in price by the hotel but reasonable enough because it is peak season of the year and we need to secure a room. But what my family really enjoyed was our swimming experience at their Alexandria Swimming Pool. I highly commend the person in charge. Ms. Rose because she’s really accommodated us together with my friend's family. Accomodating front desk officer and other employees. Even security guards are approachable. 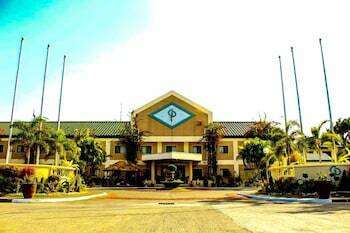 This hotel villas and resort is located near McDonald's and Puregold, drugstore. It's easy as ABC if you need something to buy if in case. If you want to eat, McDonald's is just steps away. If you feel tired and have body pain from the long period of travel, the drugstore is just steps away. The room is clean and comfortable to stay in. Value for money. Early check-out because I'm in a hurry. I did not consume my complimentary breakfast, that is why I can't say anything about the food in their resto. Room for twin sharing is a bit small but it's clean. we loved the food. It's delicious. It's also near gasoline station, mcdo, 711. They have a mini zoo and a swimming pool. Notice: 8 adults are included in the basic charge. Up to 1 extra adult can be accommodated in this room at Php 500 per person. Charge is payable at the hotel.